Inspire All-Star results from your team! Coaching, whether it be on the athletic field or in the boardroom, is deeply rooted in helping people understand their true talents and gifts and how to use those to reach their full potential. 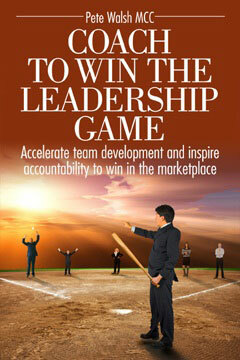 But how do you translate coaching principles from the ballpark to effective leadership practices in the workplace? Coach to Win the Leadership Game takes the tried and true principles of practices, commitment, teamwork, competition and skill building and translates them into effective leadership practices that produce winning results. Coach Pete Walsh brings his years of coaching CEOs and leadership teams to this practical guide that gives you a simple step-by-step process for building high performing, loyal and committed business teams. Whether you’re a new leader or a seasoned CEO, Coach to Win the Leadership Game is a must have to motivate your team to championship results.